This weekend we bought Cynthia her first cracker things - she has had some Ritz and Wheat Thins, but nothing like these. She loves to eat them. She is funny though. She will not use her thumb very much. 9 times out of 10, you will find her thumb safely tucked away in the palm of her hand. Because of that little fact, she can't pick up the puff and put it in her mouth. That does not stop her from picking them all up in her hands. So Ben would take her thumb and index finger, put a puff in the middle of them and put it in her mouth. One day she will figure it all out, but for right now, she is more than happy aiming for you hand with her mouth. On Saturday we were all at Smiths getting a few things for the week. One of the ladies that works there offered Cynthia a balloon, so we took it and tied it to her wrist. She had the best time playing with it. She would look at her wrist, follow the green string up to the yellow balloon, then she would move her arm and the balloon would move and she would laugh. When we got home, we tried to get it on video, but as you can see she is more interested in Ben and the green string. As you all know, there is this wonderful saying about seeing the world through rose coloured glasses. It usually means that someone is in love and seeing world perfect. Well... I went to the eye doctor today and guess what... I need some glasses. Well I don't think need, let me just explain. I have been having some eye problems. It will come and go, nothing to serious, but I thought I would check it out. So today I went to the optometrist. He did extensive testing. Today we learnt that I have two cyst on each of my eyes. The only thing that they are doing is making my eye a different shape, nothing to worry about. In my right eye I am so ever slightly near sighted. So slightly that the insurance will not even cover it. Then he did some more testing. And because of my work environment and my headache history, I am able to get some glasses to help relieve strain. I could either get some computer/reading glasses or progressive glasses. I chose the progressive glasses. They will help me see far and close with no strain and still be able to stair at a computer screen for 8 hours a day. Here comes the kicker... there will be a rose tint to them. Rose tint helps with headaches and a few other things, so the doctor gave me three rose colours to chose from. 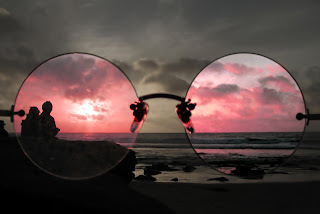 From now on I will be seeing the world through rose coloured glasses... how cool is that? Friday night we all went to the Nickel Arcade. It was so much fun. There were these rides for little kiddies, so we let Cynthia play in them to see what she would do. The Speed Racer was her first. She would not sit down. She stood most of the ride and tried to 'steer.' It was cute. The next one was Noah's Ark. Sadly it did not work. But Cynthia had a great time standing in it and looking in the mirror that was in front of her. After Mom and Dad had fun playing games, we went to see what our tickets could buy us. We learnt that our tickets could get a whole lot, but nothing that we wanted. So we got Cynthia a blow-up Zebra hammer (pictures to come), Ben got a mood ring that he has always wanted and I got a little frog that looks as though he got electrocuted. A few Sunday's ago, there was a little South African get together in Odgen. Layne came up from Provo, Eric and his cute wife, Kelly, came from where ever they were, Derek was there and of course the Ames where there (including Clarence). The hosts were Steve and Emily Ballard, the wonderful BYU couple that adopted Derek. The Roubies where meant to be there but cancelled at the last moment and Liesl and Corey could not make it due to other obligations. It was great fun to see Eric and Derek again. Derek got his mission called to San Fran! Congrates! You will have a great time! It is a beautiful city. We all can't wait for the next gathering - it will be a blast! On Friday Cynthia had her 6 month check up and shots. Before the doctor sees her the nurse lady weighs and measures her. The doctor walks in and is like "WOW, that is one chubby little girl." Then she looks at how much she weighs and it is only 17 lbs. She was stunned! Cynthia weighs 17 lbs, is 26 in tall and has a HC of 42.5 cm. That makes her below average to average. She was asking us about what Cynthia can do. So we told her and showed her what she can do. She says Mamama fluently (also different versions - eg. moma, mom, ma), she is about to start to crawl, she walks as long as we are holding her hands, she can sit up by herself, she is eating stage 1 food, loves to eat ice-lollies, complains when you take it away, talk without forming real words, blows raspberries, passes toys between her hands, takes toys away from Mom or Dad, gives Mom or Dad her toys and reads with Mom or Dad. The doctor was VERY impressed with her progress and said that her strength, motor skills and verbal ability is very advanced. So she might be average weight, below average height and HC, yet she is very advanced for her age in everything else. Little Cynthiamakes Mom and Dad so happy!